One of my favorite ways to learn about famous artists is to do a project in the style of that artist. Recently, we learned a little bit about Henri Matisse. We looked at many examples of his work, especially the work he did in the final years of his life when he created with paper cut-outs. He called it “painting with scissors.” You can find examples here. We then set out to do a fun Matisse Craft. This style of work is so much fun to do. 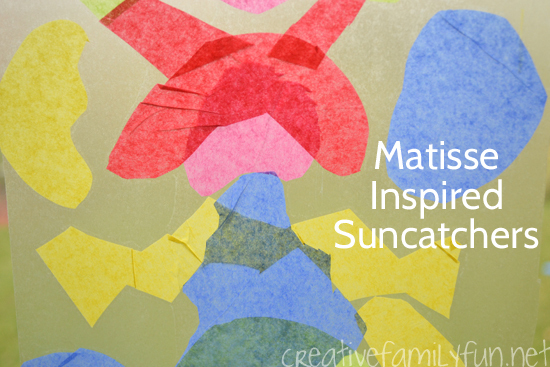 We used tissue paper for our cut-outs to create these Matisse Inspired Suncatchers. Disclosure: This post contains Amazon Affiliate and other affiliate links. Please see my disclosure for more details. 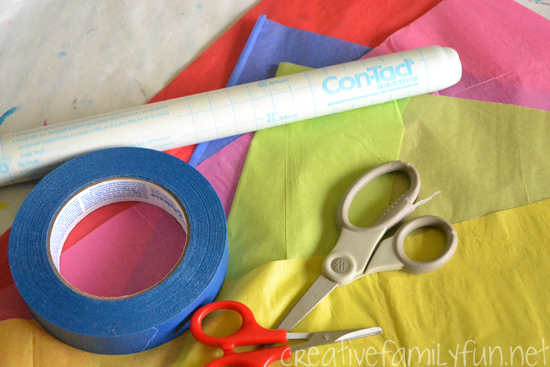 To prep for the project, cut a piece Contact Paper for each child. Ours were about the size of a legal-sized sheet of paper. You can do any size of suncatcher you want. After we looked some examples of Matisse’s paper cut-outs, we talked about ways we could make our projects similar. The girls noticed that he used large shapes and a lot of curvy lines, so we got the scissors out and started cutting. We cut a variety of shapes from all the colors of tissue paper we had. I had purchased one of those multi-colored tissue paper packs from the dollar store. There was such a great variety of bright colors. Once we had a pile of cut-outs, the girls started getting creative. We used the tissue pieces to create our pictures before sticking them to the Contact Paper. My girls arranged and rearranged until they knew what they wanted to create. 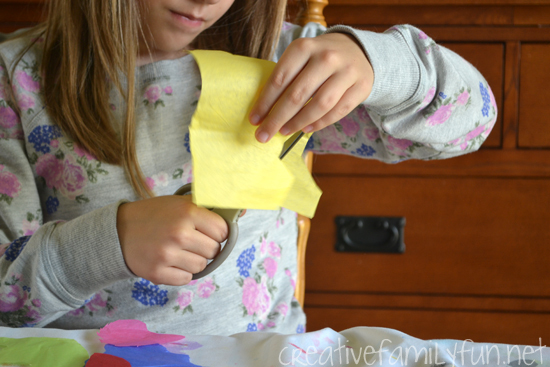 When we were ready to create our suncathers, we took the backing off of the piece of Contact Paper and used painter’s tape to stick it to the table sticky side up. We’ve made many, many suncatchers and I’ve found that it’s helpful to tape the Contact Paper to the table. That way it won’t move all over the place. If you use painter’s tape, you can remove it easily from the Contact Paper. Once we were done, we removed the contact paper and stuck it directly on the window. The Contact Paper won’t leave any sticky residue on the window. If you do want to preserve your suncatchers, you can stick another piece of Contact Paper directly over the first piece, sticky side to sticky side. In the picture below, the creation at the top is a crazy, dancing alien. The one at the bottom is a sad, crying face. I love how they both turned out! My girls were able to capture the spirit of Matisse in their own style. Perfect! If you liked our Matisse craft, be sure to check out all of the great Famous Artist ideas from the 2nd grade blogging team! 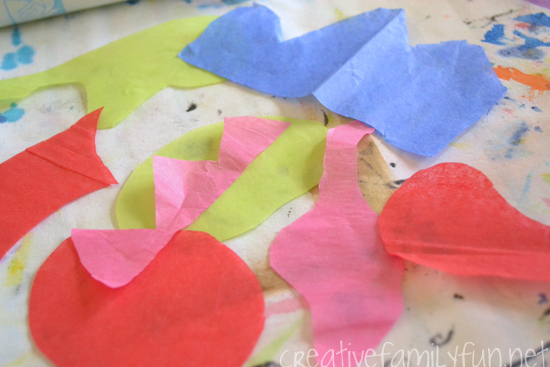 Have you seen the Meet Matisse art workshop from NurtureStore? 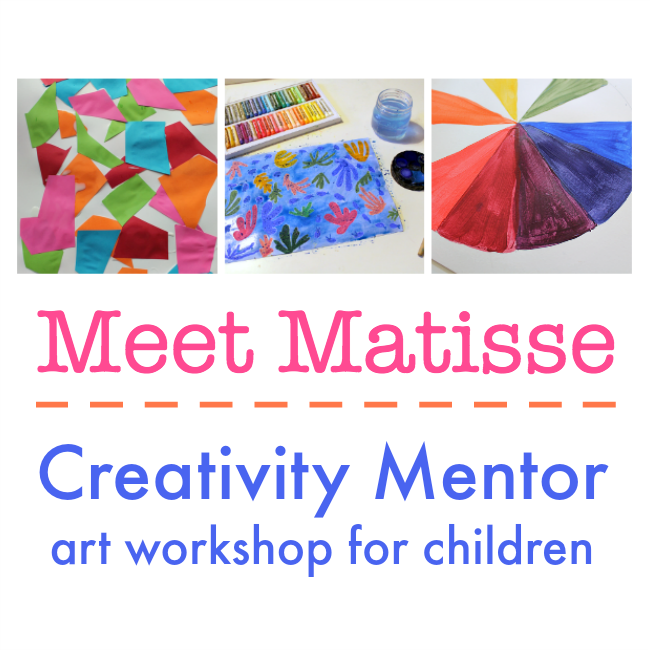 It’s a fun workshop where your children get to enjoy hands-on art projects while learning about art history, famous art, colour theory, and character-building lessons from Matisse’s inspirational life. The workshop is great for home and school – check it out here.